The world of shipping and fulfillment can seem complex and daunting if you are not familiar with it. This overview explains the many aspects and processes that make up both shipping and fulfillment, covering some of the basics of shipping like setting up shipping strategy, packaging, tracking and insurance, with a focus on balancing the shipping costs to help ensure profitability for your business. To be a successful ecommerce seller, it is always important to remember your profit margins. 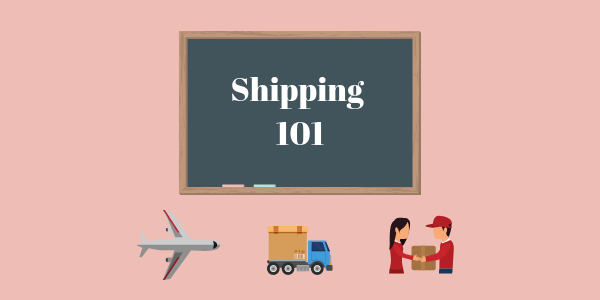 Shipping usually represents one of the more significant expenses sellers incur, and if not properly evaluated you could wind up losing money on shipping. Before you can ship your products, you first need to decide your pricing strategy when it comes to shipping. Below are some of the most common methods. Whichever one you choose should be intentional, and carefully thought out, to best keep as much profit margins as you can while also getting the most reliable shipping processes, and giving your customers a break when you can. Charge a flat rate: Charging a flat rate for shipping has become a very popular option for many ecommerce sellers. It is important to set a rate that doesn’t drastically overcharge or undercharge your customers. This option usually works best when the products being shipped have similar sizes and weights. It can become more complicated and less cost effective if you offer many different products at various weights. Charge real-time carrier rates: Having an integrated shipping system either internally or through a third-party logistics provider (3PL) that can integrate with shipping carriers such as USPS or FedEx can help generate real-time shipping options and prices for your customers. This can help your customer choose which price and service works best for them. Most shipping carriers base their rates on a combination of factors such as package size, package weight, and distance. Additional options such as insurance or enhanced tracking can also affect the final cost of shipping. Although there is no easy way to compare precisely costs across the various carriers since they may have different service levels such as delivery times, one should go through a side by side comparison of the costs, weighing costs versus the service levels expected. Generally, shipping costs vary based on two main variables: package weight and delivery times. The lighter and smaller the packages and the longer the delivery times to the end consumer are going to have lower shipping costs. There has been a lot of buzz about same day delivery, mainly because of Amazon’s Prime Now program, which delivers product in two hours, but there will be more resources from the carrier to support faster delivery times and this cost will be passed down to the shipper. Since most shipping options are based on the size and weight of the package that is being sent, it is important to make every effort to minimize the size of the shipment. This will keep your shipping costs lower which will keep your profit margins healthy and intact. This means ensuring that you are using appropriate sized boxes and lightest materials to keep what is being shipped secure while it travels. If you are using a shipping carton that is too large and filling the extra space with air pillows or dunnage that can increase the overall cost of shipping or trigger dimensional weight. Shipping insurance and tracking can offer an improved level of security and confidence, depending on what you are shipping as well as its value. With most common carriers, insurance and tracking is relatively inexpensive and provides an extra layer of protection in case a package gets lost or damaged. USPS Priority Mail and UPS offer free coverage for up to $100, which can be increased for additional fees up to certain amount up to $200 in come cases. For larger shipments of increased value, purchasing an extra level of insurance might be worth it to allow for that protection. Some shipping carriers have insurance built into the price, so it is important to understand there coverage limits when choosing among the various shipping providers. In today’s world of ecommerce the expectations of customers have grown considerably. Not too long ago packaging and shipping was an afterthought when it came to order fulfillment. Now, people are looking for shipping, packaging and presentation as part of the overall customer experience. This can mean going above and beyond just a simple brown box for many sellers who are competing in a crowded marketplace and looking for a way to differentiate shipments from their competitors. Offering a unique experience for the end consumer by using branded shipping can help differentiate your product and offer brand recognition as an additional way to help market your company. Using a 3PL for your order fulfillment needs can help automate and handle the shipping for you. When you choose to work with a 3PL, you can store your inventory at one of their warehouses. Because they can integrate directly to your online shopping portal when an order comes in your fulfillment partner will automatically be forwarded the order to pick, pack, and ship the purchase order on your behalf. Lower shipping rates: Because fulfillment warehouses ship such large quantities for multiple brands, they can negotiate higher discounts and share those discounts.They are also integrated with all of the major carriers and have the shipping systems in place, giving you easier access to the widest range of shipping options. Shorter delivery times: By strategically choosing a 3PL that has multiple locations throughout the country to store your inventory, it means that you can store your inventory closer to your customers which can also help to lower the cost of shipping since those packages will ship shorter distances. Experience: 3PLs have years of experience with shipping and stay up-to-date on latest service offerings and pricing changes in the market, so they can advise on best practices and recommended carrier offerings. Shipping can be one of the most challenging aspects for ecommerce sellers because there are so many variables to juggle. Every business faces unique factors that need to be thought out and planned for in order to develop the most cost effective and efficient shipping strategy. Understanding all of the variables and being able to change with the needs as your business grows can be integral to the long term success. It is important to take into account all of the aspects in this article as you develop that strategy. Choosing a 3PL to help with your order fulfillment process can often make it much easier as well as cost effective. If you are seeking logistics support we’d love to hear from you. You can read DCL’s list of services to learn more, or check out the many companies we work with to ensure great logistics support. Send us a note to connect about how we can help your company grow.